With cardboard signs held high and cries of, “No Justice – No Peace”, about 300 people gathered today at the intersection of Pennsylvania and North Avenues in Baltimore City for a peace march to commemorate the first anniversary of the death of Freddie Gray and the subsequent Baltimore uprising. The mile-long march, which was led by area clergy, community activists, and politicians (including mayoral candidate Catherine Pugh), moved east on North Avenue, then turned southeast onto Eutaw Place – ending at the Freddie Gray Center at 1505 Eutaw Place. Baltimore City police were on hand, freely walking with the crowd to ensure a safe and orderly demonstration. Freddie Gray, 25, died April 19, 2015 after being apprehended by police for allegedly carrying an illegal knife. Building anger in the community over Gray’s death, combined with growing distrust of police nationwide, resulted in violent protests which swept Baltimore from April 25 – 28, 2015. Six city officers who were responsible for the apprehension and transportation of Gray are awaiting trial on an array of charges. 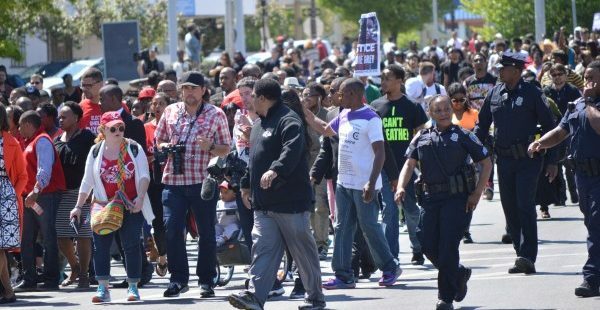 Co-sponsored by the Freddie Gray Family, the Empowerment Temple, and others, Sunday’s march was as peaceful as organizers had hoped, but far shorter than originally planned. 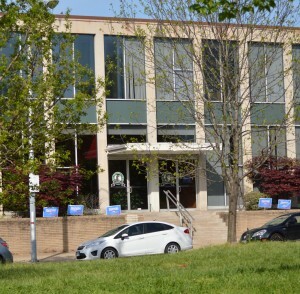 On April 5, media outlets reported that the march was to begin at Mondawmin Mall (the site of last year’s altercation between police and students from Frederick Douglas High School). From there, the march was to wind its way through Penn-North – passing the CVS pharmacy which was torched during the riots – before concluding at City Hall. A dozen or so mildly disappointed people waited at City Hall for a march which never arrived. Making heroes out of criminals is the new Black way. Freddie Gray was lowlife scum and it doesn’t,t help anything to make him into a role model for black kids.